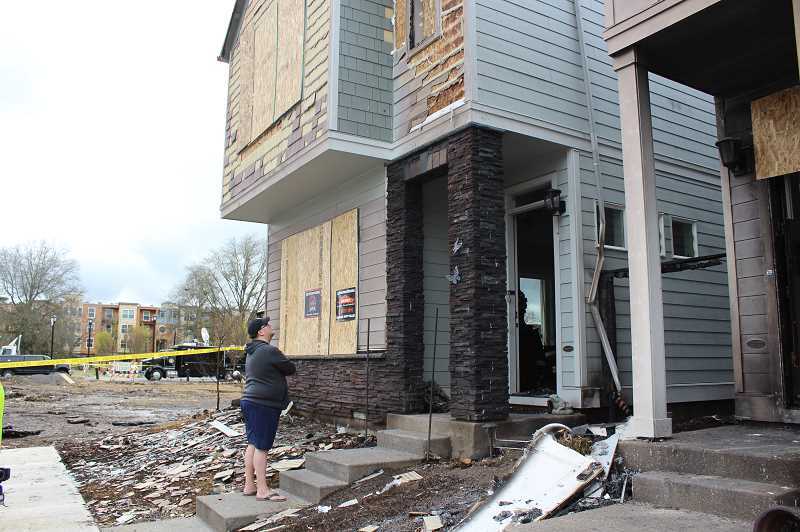 It doesn't take much — the smell of smoke, the flicker of a flashing light or the sound of a dryer revving or an ambulance siren wailing — to remind Villebois resident Tammy Lukes of the night that uprooted her family. At about 1 a.m. Sunday, March 31, a fire at a four-story condominium building along S.W. Collina Lane ignited. Three hours later, Lukes' two-story condominium located next to the building was blanketed with ash and missing a roof. Lukes and Villebois residents Michael Bell and James Brown lived in two of the five occupied structures that were destroyed by the fire and are now trying to cope with trauma and grief while attempting to reassemble their lives. "I think there are just stages that I think we're gonna all go through: the shock and the immediate disbelief, the difficulty sleeping at night, some of the smells of smoke that suddenly come up and you worry something in your immediate environment is burning," Lukes said. Following a divorce, Lukes hoped to move to a community where she and her children could make friends and feel safe. She heard Villebois fit that bill. After finding pals through a local book club and meeting her neighbors, she realized that her perception of Villebois as a close-knit community was a reality. Lukes moved to Wilsonville in 2017 and into her current home in September 2018. "I established the support system that I never thought was possible from being here," she said. In the middle of the night March 31, Lukes woke up to a sound like a whirling wind coming from outside. She found it odd. She hadn't heard a storm warning on the nightly news. So Lukes opened her blinds to find the condominium complex across the street engulfed in flames and embers hitting her window while a crackling sound blared in the background. "I processed it for a few seconds and immediately I could see on the street people running and it started to register that this is a huge deal," she said. "'I've got to get out of my house.'" Her children were staying at their father's house at the time, so Lukes scooped up one of her cats, tried to find her other cat to no avail, grabbed a few items and then scurried out of the house. After visiting her ex-husband's house, she returned to the scene to watch as Tualatin Valley Fire & Rescue firefighters tried to extinguish the fire. Unfortunately, Lukes' home took the brunt of the fire's wrath. "The neighbors were outside and we just stood there helpless just watching everything unfold," Lukes said. "There's nothing anyone of us could do." Since then, Lukes has revisited the site multiple times to try to collect salvageable items. And each time she returns, her home looks different. "My ceiling collapses a little bit more in my closet. My kid's room falls apart a little bit more and it just becomes more and more obvious that nothing is salvageable," she said. Lukes said she tells herself that many of the material items in her home are replaceable and she relays that message to her children. However, some destroyed items, like many of her personal documents and the signed picture from the movie "Cinderella" passed down from her mother to her daughter, are worth more than their material value. "It was really important to her that my daughter had that and now it's gone," Lukes said. Lukes searched for her cat for days in the home's wreckage before finally finding her three days after the fire. But Lukes has found some silver linings. For one, she said her insurance company has been helpful and she has received considerable support from her friends in the community. Lukes is also staying at one of her friend's houses until her rental home is ready. "I wouldn't be able to get through this without the support of my friends in the community. I wouldn't have a roof over my head. I wouldn't have food available to me without the support of my friends. I wouldn't have the emotional strength and mental stability to go on and do all of this stuff and laugh at some of the things that are so ridiculous and you can't believe you're experiencing them," Lukes said. "Either you cry or you laugh. We're trying to integrate more laughing than crying to get through the process." And along with convincing her to voice her opinion in City politics, Lukes testified at the Wilsonville City Council meeting Monday, April 1 and plans to attend more meetings, she said the experience has helped her realize the importance of home safety and emergency preparedness. "I wonder if they (my kids) know how to open up windows," Lukes said. "Those are the types of things people need to think about with kids and just for their own safety." Lukes isn't sure whether she will ever be able to move into her home again but wants to continue to live in the Villebois community. Meanwhile, she was looking into receiving some mental health assistance. "It's a trauma," she said. "It's a process of grief." When they moved into their condominium in Villebois last September, James Brown and Michael Bell picked out all of the appliances — from cabinets, to floors, to countertops. "(It's) beautiful, high end and we basically got everything we wanted," Brown said. But the night of the fire, Brown and Bell watched as the home they adored went up in flames. Before that point and minutes before 1 a.m., Bell saw an orange light emanating from the entrance of the nearby complex. Soon after, he rushed around the neighborhood to knock on doors to alert the neighbors. "I have no idea how he had time to do any of that," Brown said. Then, Bell and Brown whisked their two dogs into their car and left the scene. When they returned, the two watched as the blaze approached their home. Brown said he felt hopeless. "I was standing over there and screaming 'Put my house out.' I could see it burning," he said. Brown and Bell are staying at a hotel now and could barely sleep during the days following the fire. Like Lukes, seemingly innocuous noises jog their memory. "The sound, the banging. And oh my god it was petrifying this morning because a fire truck pulled up in the building next door to our hotel room," Bell said. "That even scared us." Brown said he was told the home could be rebuilt in six months and that they would be staying in the hotel until then. "They're going to have to gut it," Brown said. "They're going to have to assess the studs and see what damage there is and go from there." But first, they just want to get some shut-eye. "We just need sleep," Bell said. "A good sleep would help us a lot." Jocelyn Libby with the Trauma Intervention Program told attendees of a meeting at Lowrie Primary School Tuesday, April 2 that reactions such as feeling anxious, losing sleep and struggling to think straight after a traumatic event are normal. It was the event itself that was not normal. The reactions you all have are likely very normal to the event," Libby said. Libby recommended those experiencing trauma or grief not use drugs or alcohol to numb the pain. Instead, she advises people to hydrate, move around and tell their story to others. "The more we give words to our experience, often the better you can cope," she said.